To the cheers of millions of anti-government protesters in Cairo’s Tahrir Square and public areas throughout the country, Egypt’s Defense Minister Abdel Fatah Al-Sisi announced on national television that Mohamed Morsi was no longer president. Al-Sisi shed some light on the new political “roadmap” that the country would follow: Adly Mansour, the head of the constitutional court, will be the de facto leader during an interim period and will be charged with paving the way for new elections. The constitution has also been suspended, Al-Sisi said, as several political and religious leaders (Muslim and Christian) sat behind him. The military’s intervention and consigning of administration to a civilian body means that Egypt could be on the cusp of a new dawn, if the anticipated backlash from Morsi’s Muslim Brotherhood supporters results in limited outbursts of violence and is either quelled or dissipates on its own. But the birth of a new republic has to be nurtured under continued civilian management, parliamentary parentage, and transparent resource curation. These have been the demands of millions of Egyptians who frequented Cairo’s Tahrir Square in January and February 2011; they were echoed on Mohamed Mahmoud Street in November 2011, and again on June 30, 2013. But the rise of the Egyptian people clashed with the country’s harsh realities: Egypt has effectively been straddled between a ruling military and an 80-year-old Islamist theocracy – the Muslim Brotherhood. The hope for Egypt now is that there is a genuine third option that incorporates all elements of civil and political society and leans neither to the military nor the Islamist factions. Mansour is in an unenviable position. The millions of Egyptians who have been on the streets since June 30 are likely to support his mandate to oversee the country through to democratic parliamentary and presidential elections and the amending of the current constitution. But the importance of the millions of Egyptians on the streets calling for change is not that they stood against the Morsi government, but that they are willing to again and again march against any government [or institution, such as the military] that infringes on their rights, undermines the path to democracy, hoards power and fails to lift up the economy. Their voices were true representation of people power in the absence of a People’s Assembly, which was dismissed in June 2012. Without checks and balances, transparency and accountability as Egypt slid into a failed state, they had no choice but to take to the streets. Mansour now needs to navigate between the Islamists and military to ensure that the elections are held in an environment free of intimidation and violence. Mohamed El-Baradei, the former head of the International Atomic and Energy Agency and an influential political player, who is likely to be a pivotal member of an interim advisory council, has promised to renew national reconciliation efforts. If he succeeds, he will be able to unite a deeply disenfranchised and divided people who have seen Egypt’s economic gains of the past 20 years slowly dwindle to dangerous levels (Egypt’s strategic reserves now can support the country for only two-and-a-half months). Any interim leadership must also ensure that the least privileged sectors of society – some 70 per cent of the population live either on or under the poverty line – are able to improve their economic prospects. 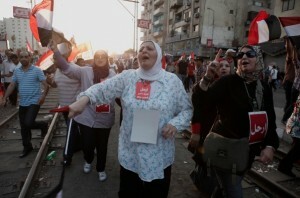 Expectations are high as Egyptians cheer in the streets. But these must be tempered by acknowledging Egypt’s recent history. It is important for people to ask how they arrived at this juncture – removal of Morsi on July 3, 2013 – and how they can avoid the pitfalls that nearly politically and economically bankrupted the country. The army took over in the year following the ouster of President Hosni Mubarak, but such an institution, no matter how powerful and nationalistic, is ill-equipped to run a country unless it enforces a military dictatorship. History has shown us that such experiments have failed in the Middle East, Asia, Africa and Latin America. The more the military tried to run Egypt by trying to curb media freedoms, clashing with protesters, and violating human rights, the more it realised that it was losing the political capital gained since the 1973 War. It conceded and set a timetable for a presidential election. At this point, one wonders if the Supreme Council of the Armed Forces, once much maligned, has learned from its own bungling and mismanagement in 2011 and has genuinely recognised that the Egyptian people will not be taken for a ride again. It remained largely silent – and some would say subdued – when Morsi was elected and then promptly replaced SCAF’s senior echelon by appointing Al-Sisi at its head. In the first few months, most Egyptians were willing to give Morsi the benefit of the doubt and hoped for socio-economic change and progress. But the contract between the leadership and the people was rubbished when independent media assessment of the President’s first 100 days revealed that his administration had done little to nothing to address the country’s growing problems. Morsi responded by declaring the media hostile and then issuing a constitutional declaration dis­missing Prosecutor General Abdel Maguid Mahmoud and replacing him with Talaat Ibrahim Abdullah. 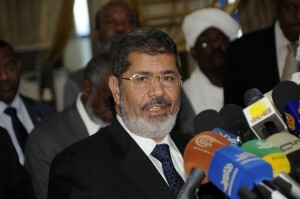 The decree also included a clause that Morsi’s assumed power could not be appealed or canceled by any individual or body; he also gave the majority Islamist constituent assem­bly an extension of two months to draft a constitution, which ultimately passed through a rushed referendum. Many criticised the new constitution for rolling back decades of slow progress in the rights of women and minorities. The President was beginning to lose the trust of the people; he was accused of hoarding power in a manner worse than the former regime. And then came a nearly endless downward spiral. The June 30 protest of millions was fueled by frustration, anger and disillusionment. Over the past few months, Egyptians had started to drown in a flood of hopelessness. The economy had become garroted due to lack of foreign direct investment and a stalled tourism industry. Unemployment and inflation continued to rise beyond the capacity of a workforce struggling to put food on the table. The persistent power and water outages, further exacerbated the frustrations of millions of Egyptians, but the last straw appeared to be the lack of gasoline a mere 10 days ago which led to kilometer-long queues of motorists hoping to fill their tanks. Egypt was asphyxiating under the weight of problems the government of President Mohamed Morsi was unable – or unwilling – to solve. The social and political changes in Egypt over the past three years will have far-reaching effects on the Middle East and North Africa for some time. The “democratic coup” – I can’t find a more suitable phrase for what happened in Egypt – that unfolded on July 3, 2013 is undeniably bound to reverberate in the region … and beyond. The people of Egypt have shown that they are the leaders in pushing for social, political and economic change, albeit the uprising came after a prolonged period of timidity. On the one hand, Egyptians have shown that the peoples of the region are much more likely to express dissent and hold their leaders accountable for poor administration and failed economic policies. On the other, events in Egypt have revealed that Islamist governance is not guaranteed success merely because it alludes to Islam and Islamic tradition. As Egyptians retire to their homes, they’re like to feel some pride that they managed to remove yet another “dictator” as the opposition has called Morsi. But they will also fear the violence that could come if the Muslim Brotherhood chooses not to acquiesce and instead resorts to battle the military and protesters. In that case, the new Egypt within grasp will fall into the pit of civil war.